If you’re going to have a train set you might as well have a big one. And if you can afford it, why not have three? Alan Bloom MBE (1906-2005) was a significant figure in the world of horticulture, the son of a market gardener, an innovator who developed new plants and new ways of planting after he bought the 228-acre Bressingham Hall estate in Norfolk in 1946. By the 1960s his nursery business and associated display garden were sufficiently successful for him to indulge his other love – live steam. He initially bought a traction engine to assist garden construction: he ended up with fourteen. Unlike his distant neighbour and near contemporary George Cushing (1904-2003), who concentrated on collecting road engines and showmen’s equipment at Thursford, Alan Bloom had a particular liking for rail-borne steam. He subsequently built a miniature railway around the periphery of the garden. Then, in the late 1960s he installed a fine set of gallopers and began to collect standard-gauge steam locomotives. 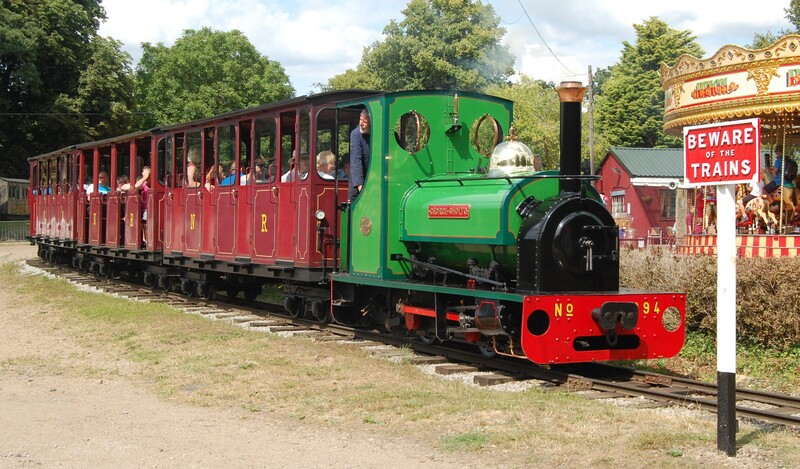 By the time of his death, the Bressingham Steam Centre, now Bressingham Steam & Gardens, had three separate narrow-gauge railways, the 10¼-inch gauge Garden Railway, the fifteen-inch Waveney Valley Railway, and the 2½-mile two-foot gauge Nursery Railway. The standard-gauge collection includes some significant items loaned from the National Collection including Great Northern Railway 990 Henry Oakley, London, Tilbury & Southend Railway 80 Thundersley and a London, Brighton & South Coast Railway “Terrier” tank, Martello, in its guise as British Railways 32662 – all of them static. The museum also owns the last surviving standard-gauge Garratt locomotive in Britain and a vast German post-war Class 52 Kriegslokomotiven (“war-locomotive”), found mothballed in a Norwegian railway tunnel, with a cab the size of a small bedsit. Like George Cushing, Alan Bloom safeguarded his legacy by establishing a charitable trust, with few employees and many volunteers, but Bressingham has none of the pizazz of the Thursford Collection, with its Wurlitzer, its dancing penguins and roller-skating milkmaids. Bressingham downplays its commercialism. It’s a relaxed affair of trains and gardens, a honeypot for families where you can wander at will. It’s an admirable place for a picnic. 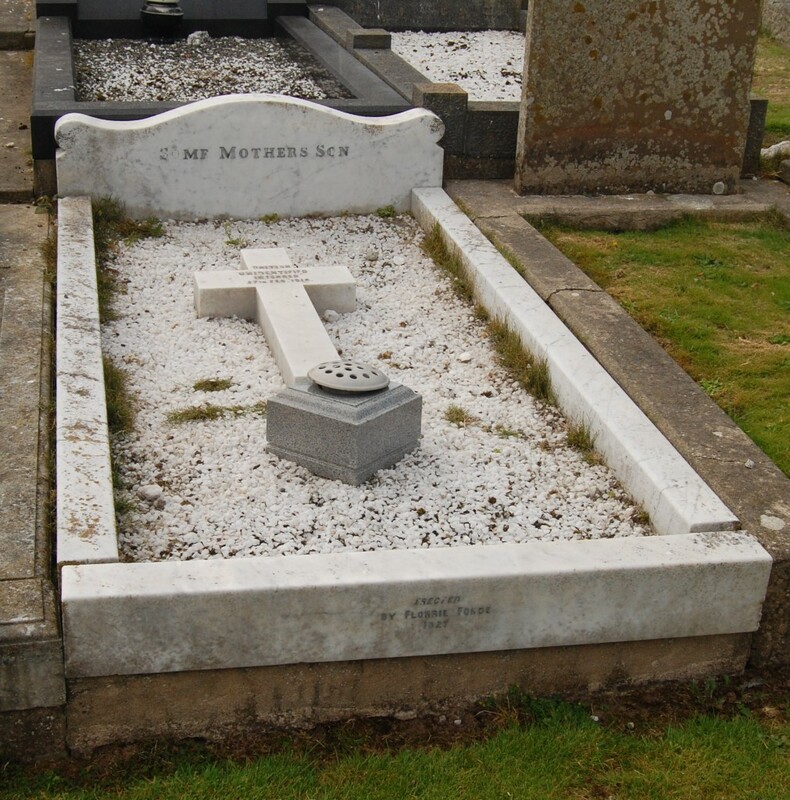 And it’s a memorial to a man whose legacy is to give pleasure to people: http://www.bressingham.co.uk/home. This entry was posted in Life-enhancing experiences, Transports of Delight on November 26, 2014 by Mike Higginbottom. It’s a long way to Carlton Colville from almost anywhere outside Norfolk and Suffolk. It lies just outside Lowestoft, the most easterly town in England. The East Anglia Transport Museum is an entirely voluntary effort started in 1965, smaller than the National Tramway Museum in Derbyshire, but designed to display both trams and trolleybuses in a realistic street setting with a tramway leading to a woodland picnic area. The core of its representative collection of trams, and the original raison d’être of the entire museum, is Lowestoft 14, an orthodox open-top car that had survived as a summer-house: it was cosmetically restored and is now undergoing a second restoration to running condition. The body of a second Lowestoft tram – one of three single-deckers though there’s so far no means of knowing which one – is used for static display. 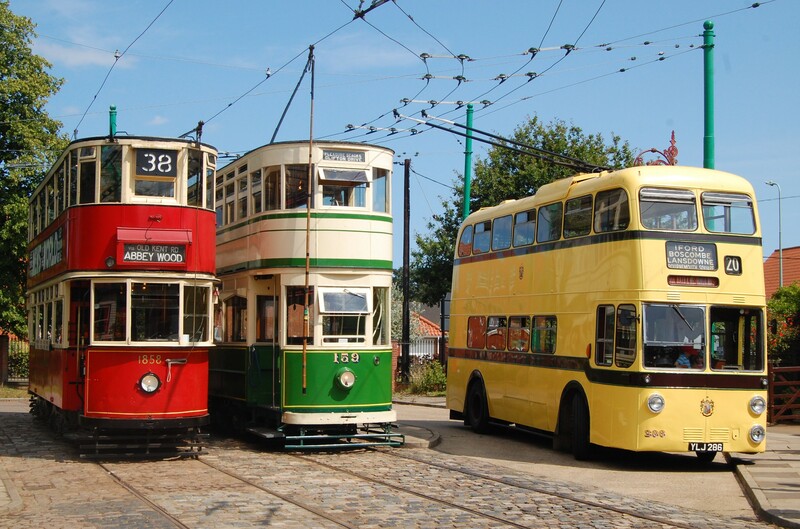 The rest of the tram fleet neatly illustrates the development of British trams – a couple of standard double-deckers, London 1858 and Blackpool 159, a modern double-decker Sheffield 513 and a modern single-decker, Blackpool 11. The more comprehensive collection of trolleybuses includes the oldest operational trolleybus in the world, Copenhagen 5 of 1926, London 1521, the very last trolleybus to operate in the capital, and a modern open-top trolleybus, Bournemouth 202. On a quiet day I found it possible to ride on everything and see most of the static exhibits within a couple of hours. The best time to visit is a special events day, for which a free bus service is customarily provided: http://www.eatm.org.uk/index.html. This entry was posted in Transports of Delight on November 21, 2014 by Mike Higginbottom. In the summer of 1914, as a great war approached, British, American and Canadian public figures were preoccupied with celebrating the centenary of the end of another war, the War of 1812, the last time that Britain and the United States were in conflict. Peace Centenary Committees on both sides of the Atlantic resolved that commemoration of the signing of the Treaty of Ghent on Christmas Eve 1814 should include the purchase and restoration of George Washington’s ancestral home, Sulgrave Manor in Northamptonshire. The manor house was built in the sixteenth century by Lawrence Washington, the great-great-great-great-great-grandfather of the first President of the United States of America. Lawrence Washington’s grandson, also Lawrence, had a younger son, himself also Lawrence, whose son, Colonel John Washington, emigrated to Virginia: his great-grandson was George Washington, the first President. Sulgrave Manor’s tenuous connection with international history saved the building, which had become dilapidated by the beginning of the twentieth century. 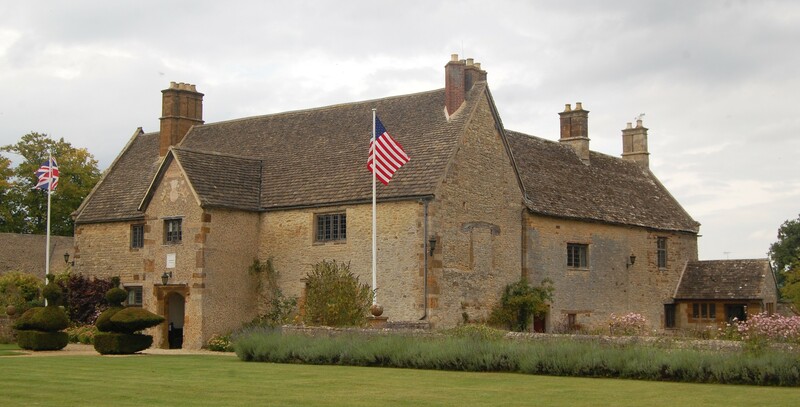 Eventually, after the end of the intervening Great War, Sulgrave Manor was opened by the Marquess of Cambridge, the brother of Queen Mary, in 1921 as a centre to commemorate and celebrate what a generation later we learned to call the special relationship between Great Britain and the United States. The principal financial supporters of Sulgrave Manor are the members of the National Society of the Colonial Dames of America, all of whom descend from an ancestor “who came to reside in an American Colony before 1750, and whose services were rendered during the Colonial Period”: http://nscda.org/museums2/uk-sulgravemanor.html. The manor is modest, partly Tudor and partly eighteenth-century. Much of the Tudor house had vanished, and to bring symmetry to its main front Sir Reginald Blomfield designed a convincing pastiche as a director’s house. Lying in a quiet corner of Northamptonshire a few miles from the National Trust’s Canons Ashby [http://www.nationaltrust.org.uk/canons-ashby-house], Sulgrave Manor provides a rare opportunity to examine an unpretentious Tudor manor house, carefully conserved, which relates the vicissitudes of a landed English family whose descendant change the face of America: http://www.sulgravemanor.org.uk/pages/2/visiting_sulgrave_manor.asp. This entry was posted in Country Houses, Survivals & Revivals: past views of English architecture on November 15, 2014 by Mike Higginbottom. John Anderson, the railway contractor who owned the Alexandra Hotel and designed Saltburn Pier, resolved this difficulty with a vertical hoist linking the Marine Terrace, just outside the Alexandra, with the pier. This structure was built of timber, and powered by water-gravity: it opened in July 1870, and carried up to twenty passengers at a time in its cage for a halfpenny each way. It was closed precipitately after an inspection in 1883, and replaced by the inclined cliff-lift (also water-gravity powered) which continues to operate on the same site. The cliff lift was developed by George Croydon Marks (1858-1938, latterly Lord Marks), chief engineer of Tangye Ltd, the company that had devised the first cliff lifts in Scarborough from 1869 onwards. It lifts passengers 120 feet from the promenade to the streets. The two cars, connected by cable, carry water-tanks beneath their carriages: the uppermost tank is filled with water and the lower tank emptied, so that the weight-differential lifts the lighter car as the upper one descends. Operation is controlled by the banksman in the upper cabin. 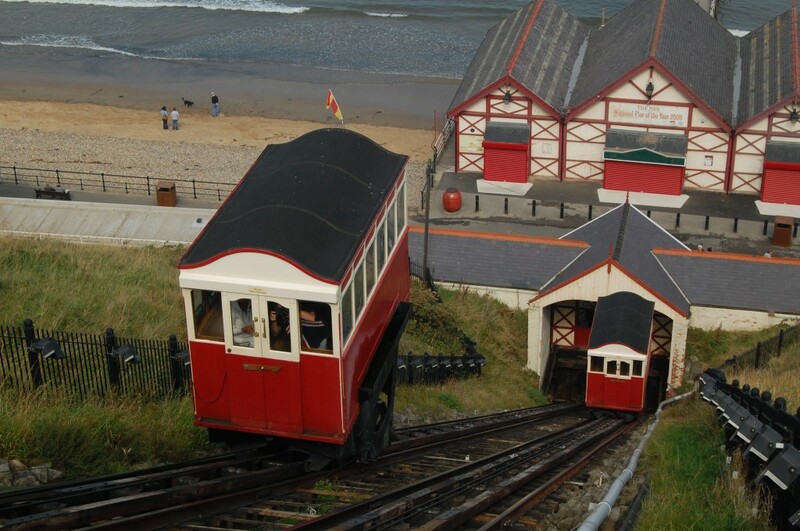 The Saltburn cliff lift is the oldest water-balanced funicular still in operation in Britain, and was upgraded for the first time in 1998 when a supplementary hydraulic braking system was added. Superficial modernisations have been reversed: the 1979 passenger cars were restored in 2011 and the upper banksman’s cabin was refurbished in 2014. This entry was posted in Fun Palaces, Victorian Architecture, Yorkshire's Seaside Heritage on November 7, 2014 by Mike Higginbottom. One of the first purchasers of Improvement Company land in Saltburn was John Anderson, a railway contractor who had worked for the Stockton &Darlington Railway and who also had ironworking interests locally. He built the Alexandra Hotel, intended to be the centre-piece of Britannia Terrace, and invested funds and enormous energy in the resort. He was the driving force behind Saltburn Pier, such that construction was well under way before the enabling Act was passed, and the structure was open to the public in May 1869, only eighteen months after the initial public meeting to propose the idea. The original length was 1,500 feet, but after a storm on October 15th 1875 in which a section of Saltburn Pier collided with Redcar Pier, Saltburn Pier was shortened to 1,250 feet. The Pier Company was wound up in 1879 and its assets transferred to the Improvement Company and then in 1883 to the Owners of the Middlesbrough Estate. The pier head was widened, with new refreshment rooms and kiosks, a bandstand and gas lighting, in 1884, and subsequently with electric lighting in 1887. A collision in 1924, when the china-clay carrier SS Ovenbeg punched a 210-foot gap in the pier, was repaired by 1929, and a theatre was added the following year. The local council took over the pier in 1938, and at the start of the war it was breached as a precaution against invasion. The gap was not repaired until 1952, and gales in the following winter required repairs that took five years to complete. Storms in 1971, 1973 and 1974 successively shortened its length to 1,100 feet, and after a demolition threat and a popular campaign to save the pier it was truncated to 681 feet and reopened in 1978. 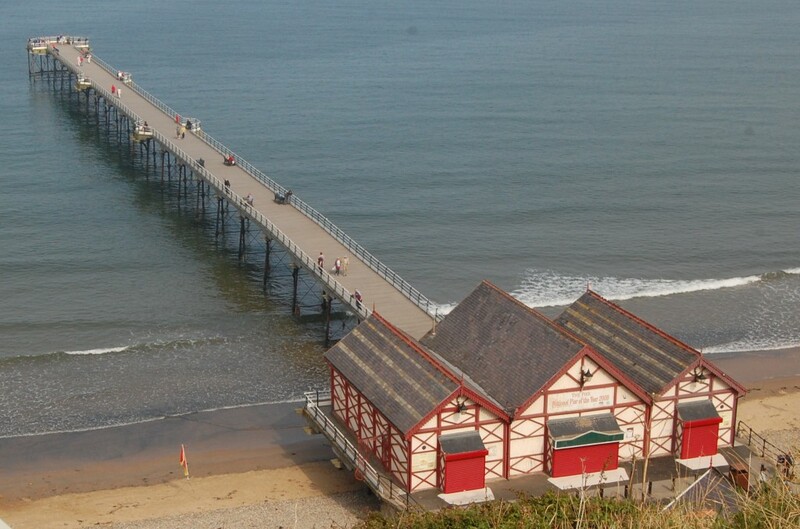 Refurbished by a £1.2 million lottery grant in 2000 and listed Grade II*, Saltburn pier is now celebrated as the only surviving seaside pier on the Yorkshire coast. This entry was posted in Fun Palaces, Victorian Architecture, Yorkshire's Seaside Heritage on November 4, 2014 by Mike Higginbottom.